Elsie Ivancich Dunin was born in the United States of Croatian and Hungarian parents. From them she learned kolos and dances of their native region, but her introduction to organized folk dancing came when she was a freshman at the University of California at Los Angeles (UCLA). Later she became the first graduate student in the newly formed Department of Dance to complete a master's thesis (1966) with a dance ethnology focus. Elsie was active with the Folk Dance Federation of California (South), from the mid-1950s until the 1980s, including a role as chairperson of the Archives Committee. Intermittingly during years 1968–1979, Elsie directed Betyárok, a performing group dedicated to Hungarian Dance, and while on faculty at UCLA, lead a student group performing dances from Yugoslavia. 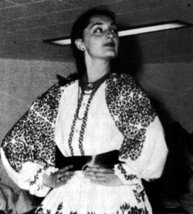 Leading up to her professional dance activities, Elsie returned to Yugoslavia in 1957 to study dances and folklore material (she had already traveled there as a teenager with her parents for several months in 1951); while in Macedonia, she was invited to be a performing member with "Tanec," a professional folk dance ensemble based in Skopje, Macedonia. Back in the U.S. and for two years, 1959 to 1961, Elsie presented a half-hour radio program, bi-weekly, on folk dance music for radio station KPFK-FM in Los Angeles. As of the late 1950s, she was frequently invited to teach workshops and institutes on dance at several colleges, universities, and recreational folk dance organizations on the West Coast. Elsie completed her Master of Arts thesis, Department of Dance, UCLA, in 1966. The title: "Silent dances of Dinaric Mountain area: analysis of purpose, form, and style of selected dances." In the 1960s, doctoral studies in the field of dance did not exist. This title was the earliest "dance ethnology" thesis in the Department of Dance that was established in the College of Fine Arts at UCLA in 1962. After 1967 she made frequent trips to "former" Yugoslavia, primarily to document and to conduct research on Romani (Gypsy) dances in Macedonia. A decade later, a sabbatical year was spent in the Dubrovnik area of Croatia (1976-1977) to delve into a comparative study of dance continuities and change among California's South Slavs with their emigrant source areas. From 1992 to 1993, Elsie was co-chair of the UCLA Department of Dance. She retired from UCLA in 1994. Retirement for Elsie, however, does not mean inactivity! She is currently active as a dance research associate with the Institute of Ethnology and Folklore Research in Zagreb, Croatia. As a dance ethnologist (in Europe, the term is ethnochoreologist), Elsie has focused on dance research projects in southeastern Europe; some current field research is reported in Cross-Cultural Dance Resources (CCDR) website (see "Notes From the Field") and . She was the organizer of an international symposium of the ICTM Study Group on Ethnochoreology, held in Korčula 2000. Themes were "Sword dances in ritual complex" and "Revival of dance culture" (proceedings were published in 2001 – see below). Elsie was also the organizer of an international meeting "Moreška: past and present" held in Korčula on 2001 (symposium proceedings were published 2002). Another symposium project was for Cross-Cultural Dance Resources (CCDR) in Flagstaff, Arizona 2003, "Applying dance ethnology and dance research in the 21st century." In 2014, she was responsible for another ICTM Study Group on Ethnochoreology symposium in Croatia on the island of Korčula. See online . She continues to present dance research papers at international and national conferences, publishes articles and monographs on dance events of the Macedonian Roms (Gypsies), South Slavic diasporas in California and Chile, and in Croatia studies of weddings with Lindjo dancing in the Dubrovnik area and sword dancing on the island of Korčula. She co-authored a book on Macedonian dances with Stanimir Višinski (text in Macedonian and English, with Labanotation scores), published in Macedonia in 1995, compiled and edited a resource book 2006, about Korčula's sword dance Moreška, and edited and co-edited several volumes for the ICTM (International Council for Traditional Music) Study Group on Ethnochoreology (for symposia held in 2000-Korčula, Croatia; 2002-Szeged, Hungary; 2004-Monghidoro, Italy; 2006-Cluj, Romania; 2008-Kuala Lumpur, Malaysia; 2010-Trešt, Czech Republic; 2012-Limerick, Ireland; 2014-Korčula, Croatia). Elsie is married to Stanley Dunin, past president of a computerized title insurance service company, and past volunteer in the Peace Corps (1990s). They have two daughters, grandchildren, and great grandchildren. "Adriatic dance"; "Macedonia." Selma Jeanne Cohen (founding editor), International encyclopedia of dance 6:428-431. New York: Oxford University Press, 1998. "After the ashes of war: continuity and change in the costume, music, and dance of a Croatian village." Resplendent dress from southeastern Europe: a history in layers. Fowler Museum textile series 2:194–205. Los Angeles: Fowler Museum at UCLA. 2013. "Change in South Slav/American Dance." Dance Research Journal 14(1/2):59-61. 1982. "Čoček as a ritual dance among Gypsy women." Makedonski folklor 6(12):193–198. Skopje, Yugoslavia: Institut za Folklor, 1973. Dance occasions and festive dress in Yugoslavia. UCLA monograph series 23. University of California at Los Angeles: Museum of Cultural History, 1984. Dance research: published or publicly presented by members of the Study Group on Ethnochoreology. (Editor.) Los Angeles: International Council for Traditional Music Study Group on Ethnochoreology, 1991. DdA reference format for dance. Elsie Ivancich Dunin; Candi Harrington deAlaiza (co-authors). Los Angeles: by authors, 1988, revised in 2010. Available as PDF on the CCDR website . "First festival of sword dances on Korčula Island: a retrospective." Folk dance scene 34(2):8. Los Angeles: Folk Dance Federation of California, South, 1998. "'Folklor' ('dance and dancing') representing Macedonian cultural identity." Proceedings 30th annual conference Congress on Research in Dance: Dance, culture and art-making behavior: 145-158. Tucson, Arizona: Dance Division, School of Music and Dance, University of Arizona; Congress on Research in Dance, 1997. "Gypsy dance." Selma Jeanne Cohen (founding editor), International encyclopedia of dance 3:330-331. New York: Oxford University Press, 1998. "Gypsy wedding: dance and customs." Makedonski folklor 4(7-8):317-326. Skopje, Yugoslavia: Institut za Folklor, 1971. "Influence of Folk Dance 'Ensembles' upon 'Folk Dance'." Dunin, Elsie. Viltis 28(1):9-10. 1969. "In search of continuity: tombstones and dance in the Dubrovnik area." Barbara Sparti; Judy Van Zile (editors), Imaging dance: visual representations of dancers and dancing:53-76. Hildesheim, Germany: Georg Olms Verlag AG, 2011. "Lindjo in the context of village life in the Dubrovnik area of Yugoslavia." Lynn Ager Wallen; Joan Acocella (editors), A spectrum of world dance. Dance research annual 16:1-4. New York: Congress on Research in Dance, 1987. "Linked sword dances on Korčula island." Rattle up my boys 1(20) November):4–6. Lancashire, England: Jeff Lawson, 2012. "Migrations and cultural identity expressed through dance: a study of dance among South Slavs in California." Nikola Tasic; Dusica Stosic (editors), Migrations in Balkan history: 161-170. Beograd: Serbian Academy of Sciences and Arts, Institute for Balkan Studies, 1989. "Mis Roma of 1997 is 15 year old Tirana, Albanian high school student Eriona Gjonaj." Homer Cates (editor), Newsletter of the Gypsy Lore Society 20(3, August):1, 3-4. Londonderry, NH: Gypsy Lore Society, 1997. Past into the present: weddings of the Dubrovačko Primorje. Dubrovnik: Matica Hrvatska-ogranak Dubrovnik. (Bi-lingual-Croatian and English, 58 photographs in color, references, 2013. "Personal computers and dance ethnology research." 1991 yearbook for traditional music 23:113-124. New York: International Council for Traditional Music, 1991. "Romani dance event in Skopje, Macedonia: research strategies, cultural identities, and technologies." Theresa Jill Buckland (editor), Dancing from past to present: nation, culture, identities:175-198. Madison, Wisconsin: University of Wisconsin Press. 2006. "Tanec performers as cultural exchange pawns." Folk dance scene 33(6):8-9. Los Angeles: Folk Dance Federation of California, South, 1998. "The Moreška dance/drama on the island of Korčula (Croatia): a Turkish connection?" Arzu Öztürkmen, Evelyn Birge Vitz (editors), Medieval and early modern performance in the eastern Mediterranean: 503–514. Turnhout, Belgium: Brepols Publishers NV. 2014. "Transmission and diffusion: Macedonian dances 1938-1988." Studia Musicologica Academiae Scientiarum Hungaricae 33:203–213. Budapest, Hungary: Akadémie Kiadó. 1991. "Winter dance events among South Slavic immigrants in California." Makedonski folklor 8(15-16):165-175. Skopje, Yugoslavia: Institut za Folklor, 1975. "Yugoslav and Bulgarian dances in the California folk dance movement." Folk dance scene 18(10):6-8. Los Angeles, California: Folk Dance Federation of California, South, 1984. Yugoslav dance: an introduction and list of sources available in United States libraries. 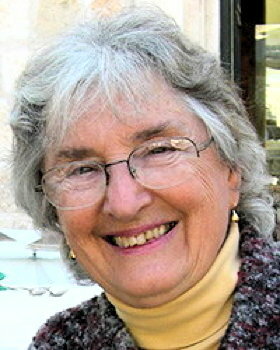 Elsie Ivancich Dunin; Nancy Lee Ruyter (compilers, editors). Palo Alto: Ragusan Press. 1981. 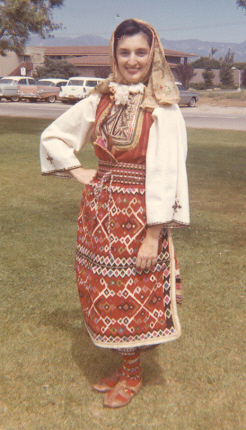 Elsie taught dances and prepared dance descriptions for Folk Dance Federation workshops and conferences (1958–1972). Among the dances learned from dancers, teachers, and written sources in "former" Yugoslavia and introduced to folk dancers in California: Balon, Berovka, Biserka, Bitola Moj Roden Kraj, Bufčansko, Čačak, Četveronjak, Cigančica, Crnogorka, Čuješ Mala, Ćuperlika, Divna Divna, Djurdjevica, Duj-duj, Ersko Kolo, Glamoć, Gružanka, Igrale se Delije, Jabučica, Jansko Kolo, Kačerac, Kolo iz Ripanj, Kolo Najstarije, Kopačka, Koso Moja, Koutre Šivat, Lesnoto Oro, Ličko Kolo, Lindjo, Marko Skače, Metva, Mista Kolo, Moravsko Kolo, Niševljanka, Osman Aga, Poskok, Potam Povam, Potrčano, Ranče, Ratevka, Red Boots (Piros Csizma), Rokoko Kolo, Sadilo Mome, Sarajevka, Savila se Bela Loza, Seljančica, Šetnja, Širočko Kolo, Sitno Bole, Slavonsko Kolo, Šlroteš, Stara Makedonka, Staro Sito, Starobosansko Kolo from Glamoć, Svadbena Polka, Statbeni Rejc, Ta Poskočna, Tandrčak, Ti Momo, Tropnalo Oro Golemo, Trusa, U Šest (Moravac), Zaječarka, Žakle Šivajo, Žakli, Žensko Krsteno, Žikino Kolo.